As a teenager, The Body Shop was one of the first beauty and skincare brands I explored. The products are affordable for people of all ages, be it young people spending their pocket money or your average working gal. I think the combination of the brand’s breadth of products, including make up, skin care and hair care, paired with their ethical stance has boosted their popularity and created a reputation that few other brands have achieved. 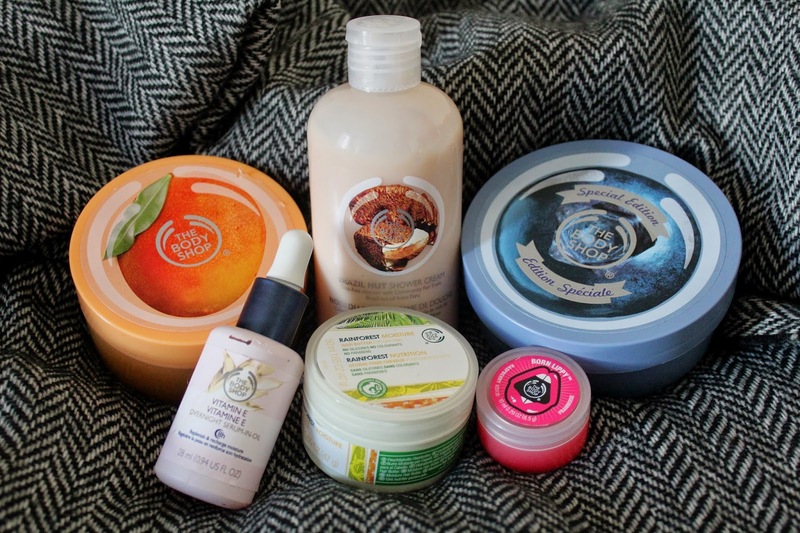 Here are a few of my favourite products from The Body Shop, some are old favourites and others are recent purchases! At just £3 this is an absolute bargain! I love nutty scents and find The Body Shop shower creams feel so luxurious on the skin. This is a repurchase over and over! There was a lot of hype in the blogging world when the Vitamin E range launched. After several trips to different branches of the store, I finally got my mitts on this overnight serum. It’s really lightweight, non greasy and, surprise surprise, smells incredible – the nearest thing I can liken it to is a mixture of a musk and flowers. It’s made a real difference to my skin and helped boost my natural glow. Another delectable fruity scent, I’ve gone through pots and pots of their scrubs and will continue to. For sensitive skin such as mine, I find these aren’t too rough on the skin and still do the job. I have the mini version of this mask pictured but the full sized 200ml pot costs just £3! I got this as part of a gift set at Christmas and this is by far my favourite product from the range. It’s thicker than normal hair masks and feels like you’re rubbing night cream into your hair, giving it a real hydration boost and added shine. I believe this is the first lip balm I ever bought so I have it to blame for my lip care obsession. They smell incredible, are slightly pigmented, nourishing and come in little cute pots. What more could you want?